An incredible rescue was caught on police body camera in the town of Hamden. Police said all of the people who were involved in the incident were unharmed, but the video released by the department on Tuesday shows the intense moments a man tried diving off the edge of a balcony. Body cameras have been a part of the police uniform in Hamden for four years. Just last week, one of those cameras recorded in incident from the perspective of Officer Justin Martin. 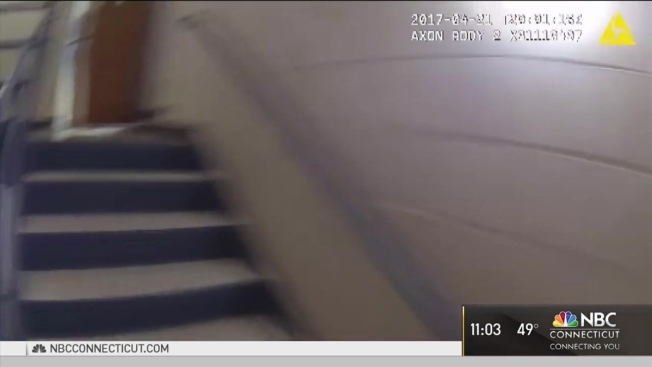 His department-issued body camera showed Martin climbing the stairs inside the Whitney Center assisted living facility on Friday. He had been called to the property for a report of a combative elderly male resident. Police said the man spoke with Martin briefly upon arrival but then walked away and headed for the staircase. “He kind of wandered off," said Martin. "I lost sight of him for a minute." But the officer pursued, following the sounds of that man as he moved up the stairs. “I listened, realized he was going up the stairs," Martin said. Police said the man went all the way up to the sixth floor. Martin, with his body camera recording, was closing in - just in time. “I went around the corner and I saw light, like what was leading to an outdoor roof, so I got nervous at that point," said Martin. Police said the man was heading for the edge of the balcony, where there was a six-story drop to the ground below. Investigators said the man tried to take a dive head-first over a waist-high railing, but Martin reached out at the precise moment to save him. “I was able to grab his foot and he had a belt on so I was able to grab the belt. I got both hands on his waist and I was able to pull him up after that," said Martin. Investigators said the man involved was not injured, but that he was taken to the hospital for evaluation. A request for comment from the assisted living facility was not immediately answered. The National Suicide Prevention Lifeline: 1-800-273-8255. It is open 24 hours a day, 7 days a week. For more information, this is their website.